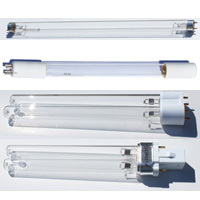 Lowest Prices for first quality low pressure mercury, level 1 or 2 capable Quartz UV bulbs! Compact UV Bulbs in PLL (G11) and PLS (G23 & GX23) styles, now including the proprietary G11 UVC lamp to fit some Tetra UV Sterilizers. Keep in mind that the vast majority of Compact UV Bulbs are standardized (a few companies such as Tetra have proprietary bulbs for their UVs), so these bulbs will fit most units that calls for the proper wattage and base. We sell compact UV replacement lamps to fit 98% of units available, and if your unit calls for example the 5 watt UVC bulb, our 5 watt replacement will fit.